The Latvian naitional coat o airms wis formed efter the proclamation o an independent Republic o Latvie on November 18, 1918, an wis offeecially adoptit on Juin 16, 1921. It wis especially creatit for its independent statehuid. The naitional coat o airms combines seembols o Latvian naitional statehuid as well as seembols o auncient historical destricts. The sun in the upper pairt o the coat o airms seembolizes Latvian naitional statehuid. A stylized depiction o the sun wis uised as a seembol o distinction an naitional identity bi the Imperial Roushie Airmy's Latvian Riflemen durin Warld War I. Durin the war the sun figure wis fashioned wi 17 rays that seembolised the 17 Latvian-inhabitit destricts. The three stars abuin the coat o airms embody the idea o the inclusion o historical destricts (Vidzeme, Latgale an combined Courland-Semigalie (Kurzeme-Zemgale) intae the unitit Latvie. Culturally historical regions are an aa characterized bi aulder heraldic figures, which awready appeared in the 17t century. Courland an Semigalie (Wastren Latvie) are seembolised bi a reid lion, which appears as early as 1569 in the coat o airms o the umwhile Duke o Courland an Semigalie. Vidzeme an Latgale (Eastren Latvie) are seembolised bi the legendary winged siller creature wi an eagle's heid, a griffin. This seembol appeared in 1566, when the territories kent the day as Vidzeme an Latgale haed come unner Lithuanian control. The Latvian naitional coat o airms wis designed bi the Latvian airtist Rihards Zariņš. The proper uise o the Latvian coat o airms is firmly regulatit. Three types o seembol are uised - the lairge coat o airms, the sma enhanced coat o airms an the sma coat o airms. The Lairge Coat o Airms is uised bi the Preses o Latvie, the Parliament, the Prime Meenister, the Cabinet o Meenisters, govrenment ministries, the Supreme Court an Prosecutor General, as well as Latvian diplomatic an consular missions. The Sma Enhanced Coat o Airms is uised bi the Parliament agencies, the Cabinet o Meenisters an ither institutions unner direct or indirect supervision o the govrenment meenistries. The Sma Coat o Airms is uised bi ither govrenment institutions, municipal authorities an educational institutions on offeecial documents. When Latvie wis pairt o Soviet Union, the coat o airms o the Latvian SSR wis uised, this wis replaced bi the 1918 airms again in 1990. 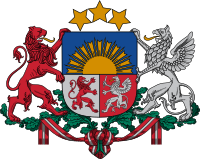 Wikimedia Commons haes media relatit tae Coats of arms of Latvia.